Born in 1947, Jay graduated from the United States Military Academy at West Point in 1969. During his six years in the U.S. Army, he served in Vietnam as a military advisor to the South Vietnam army. Upon returning to the United States, Jay served as Aide-de-Camp to General Henry Miley, Commanding General of the United States Army Material Command. 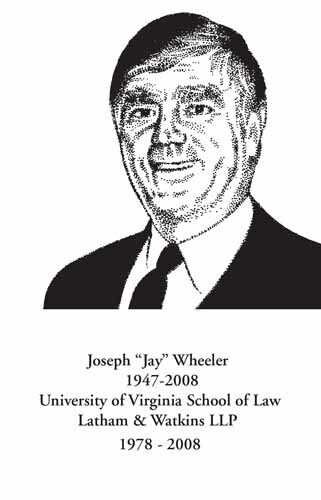 Jay graduated from the University of Virginia School of Law in 1978 and went on to serve as Law Clerk to the Hon. Roger Robb, U.S. Court of Appeals for the District of Columbia circuit. Jay moved to Los Angeles in 1979 to join Latham & Watkins. He relocated to the San Diego office in 1982, where he became a senior partner and one of the firm’s principal trial lawyers. Jay tried business disputes to verdict, in areas of securities, antitrust, intellectual property, real estate, contract and employment law, and represented an impressive roster of clients. He loved the courtroom and was fearless about trying cases. Although he prepared cases methodically, his demeanor before juries was calm and sincere. In 2005, Jay and Ed Chapin founded Chapin Wheeler, with Jill Sullivan. He was driven by his enthusiasm for representing plaintiffs, love of the law and cutting-edge legal arguments. With clients and colleagues alike, Jay gave people his full attention so that everyone felt understood, energized and enlightened. Jay was willing to do the hard work himself. He had a great sense of fun, played practical jokes, and loved to laugh. He was serious about his craft, and cases, but he never took himself seriously. He exuded calm, and he was always able to find the humor in any circumstance. Jay’s brilliance, humor, and powerful but easy nature are deeply missed.